We are back with Season-2 as a new concept of (Singing Competition) Show different from Indian Idol, Rising Star, Sa re ga ma pa and The Voice India. This is India’s Finest Digital Media Entertainment where the complete show will be uploaded to our You Tube Channel with all best performances and will be promoted through INTERNET MARKETING ACTIVITIES by which the best participants will get not even national but international exposure. Our main focus is to enhance the participants, who are talented but not getting the right platform to show their talent to the world. We believe that KJ Motion Pictures is the starting platform where you can step in for your future in singing. KJ Motion Pictures appreciate the best performers and also provide the prize money and trophies to the winners to boost their confidence. KJ Motion Pictures gives you the chance to get your music heard by the right people so that you will get to know about your mistakes and correct yourself. 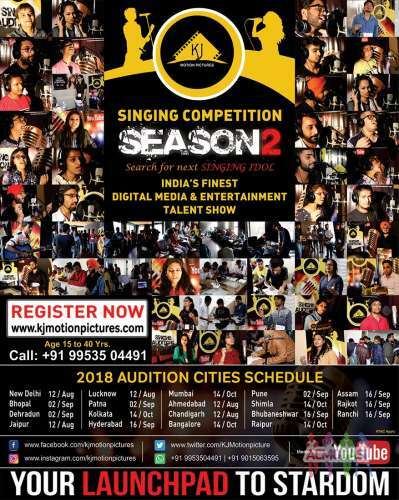 We know in today’s world, various singing auditions are taking place and some of them does the fake promises as well, but KJ Motion Pictures is totally new concept and our main motto is to keep the trust of the people and make our show a huge success. Everyone enjoys a little attention and recognition for their talents. KJ Motion Pictures gives you that opportunity. You can start by showing your profile and singing some of your favorite songs. Part of that process is recording videos and sharing them with your friends or making new friends who enjoy singing as well. Before long, you'll have a wealth of new friends who are watching and sharing the new videos that KJ Motion Pictures have created and upload on YouTube. Interested participants can register themselves by filling this registration form and after that pay the registration fee of Rs. 500/- only via the payment link through Online Mode and very soon we will inform you about the audition venues according to your city selections. Participants from any city or country can register because the competition is on national level and already we are getting a huge number of registrations daily. Interested participants can register themselves by filling this registration form and after that pay the registration fee of Rs. 500/- only via the payment link through Online Mode. Description Who knows? Who is going to be the India's Next Singing Idol? Hi myself Abhishek, we r looking for male and female models and girls for work in Events hostess and photoshoot projects.